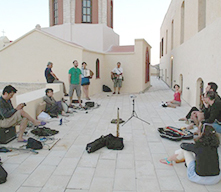 Over a period of 5 days the participants will acquire theoretical and empirical knowledge on how to effectively capture and record environmental sounds of all sorts in their origin and will be challenged to create original sound works based on their experiences of the island's soundscapes. Extensive field-recording sessions will take place in miscellaneous urban, rural and even aquatic locations involving a broad array of techniques and equipment. Special sessions dedicated to auditioning, editing and appropriating recordings in the context music/sound-art projects will also take place and composition-related issues will be discussed in length. The workshop is open to anyone interested in environmental sound and related artistic practices either as a practitioner or as an enthusiast. No prior recording or artistic experience is assumed nor are the participants required to have their own equipment (there will be equipment available to use). What to bring with you: Recording equipment and microphones (if available). Laptop with your sequencing/synthesis software of choice (if interested in experimenting with acquired sounds during the workshop). Data storage media (memory cards, used sticks, hard drives, etc) so that you may take the sounds you've recorded back home. The necessary mood for an adventurous and creative experience! Participation costs: 150 euro per person (includes 5 nights accommodation in single or twin en-suite bedroom in the refurbished Old Jesuit Monastery guesthouse). * For participants interested in attending both the workshop and this year's Sounding Paths residency the combined cost for both (20 July – 3 August) is 200 euro. Entries / Information: soundmeetings@gmail.com . Places are very limited (max. 20 participants) and registration will be made on a first come, first served basis, so please apply early! * Participants interested in attending both workshop and residency should also send a short bio, and brief project proposal for the residency (a few sentences will do). Please include web links or audio / video files with samples of relevant work, if available, as they will help us a lot in the selection process. The workshop is organized in association with the the Syros Institute.